"for it is just like a man about to go on a journey, who called his own slaves & entrusted his possessions to them. to one he gave five talents, to another, two, and to another, one, each according to his own ability; and he went on his journey." we are each given a measure. a capacity. some have small arenas, others large. the amount is inconsequential, as they were given "each according to his own ability". 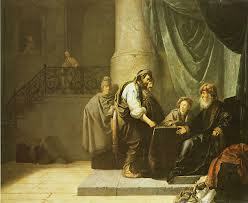 i had long thought this parable was enlightening the subject of finances & the nature of investments. of how God's people are proactive investors not reactionary, fearful hoarders. but He wasn't just talking about money but favour for to each He gives according to their measure. each servant was given something because they had the capacity to use it. proper stewardship is using what we've been given in order to gain increase. also the one who had received the two talents came up and said, 'master, you entrusted two talents to me. see, i have gained two more talents.' his master said to him, 'well done, good & faithful slave. you were faithful with a few things, i will put you in charge with of many things; enter into the joy of your master." but his master answered and said to him, 'you wicked, lazy slave, you knew that i reap where i do not sow & gather where i scattered no seed. then you ought to have put my money in the bank, and on my arrival i would have received my money back with interest. 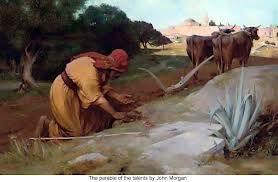 therefore take away the talent from him, and give it to the one who has ten talents." for the first slave, who was given more responsibility with the five talents, his greater responsibility was rewarded. but the opposite can also be true. we've all watched those who have been given great opportunities squander them and fall into greater judgement. they are held accountable to what they were given & ultimately will give an answer for their unfaithfulness. scripture is clear on this point in luke 12:48. of equal interest is that the master's rebuke doesn't correct the slave's view of him as a 'hard man' but addresses the servant's response to that view of him. the servant still hadn't done the right thing, even if he had a misguided view. his actions, or lack thereof, were still judged with the same weight regardless of what the servant's perception of the master was. "for whoever has will be given more, and they will have an abundance. whoever does not have, even what they have will be taken from them." in the same way that faithfulness is rewarded, so is unfaithfulness judged. judged not by me or anyone else on this earth. but by the master. the one who sees it all. the one who sees the legitimate excuses & cares of life. but the one who gives to "each according to their measure". i realize this scripture could be read as giving the impression that the master is a cold greedy man but not my Master. and it is in the context of His overflowing kindness & love towards me that i carry this righteous fear of Him. i want to spend my life, spend the favor He so generously bestows on me as the wise... not as the unwise. no more excuses, as valid as they may be. i don't want to be like the foolish servant, too cowardly to use what i've been given, burying the favor i have been given in a field of excuses, among the drudgeries of daily life, unaware of the masters approach. no. i want to max my life out, making the most of every opportunity, taking the risk, investing in good stock, multiplying the favor i have been given, anticipating, even hastening the day of the Master's return. "be very careful, then, how you live - not as unwise but as wise, making the most of every opportunity." "nothing is worth waking up and saying 'i'm not the person i wanted to be'"